Great history lesson from Rob Hanna with Preservation North Dakota! Tickets ON SALE FOR PND's Mini Van Tour to Denbigh Experimental Forest, Velva, and Wilton ND! Join us for a tour of the historic Denbigh Experimental Forestry Station and Velva, North Dakota. During the 1930s the Great Plains experienced massive soil erosion caused by drought, poor soil maintenance and high winds. The US Forest Service founded the Denbigh Station and experimental forest as a site to find improved methods to hold the sandy soils with trees, especially various shelterbelt designs. Two cabins have been restored and the forest itself remains. Join us with Ranger Casey Johnson and retired USFS archaeologist Tom Turck for a tour of the site. Afterwards we will see historic sites in Velva, including the Eric Sevareid home, a late Victorian home and two important pieces of infrastructure. Preservation North Dakota was well-represented at the 2017 Northern Great Plains History Conference held in Grand Forks, October 4-7. PND would like to thank the panelists who presented on a variety of preservation topics. Browse member photos from our tour of Southeast North Dakota. Stops along the way included the Stutsman County Courthouse , Gill School, Casselton Heritage Center Episcopal Stone Church, Bagg Bonanza Farm, Fort Abercrombie State Historic Site, the Stern House, and the Kinzler House. Special thanks to Meagan Schoenfelder for sharing such wonderful images! 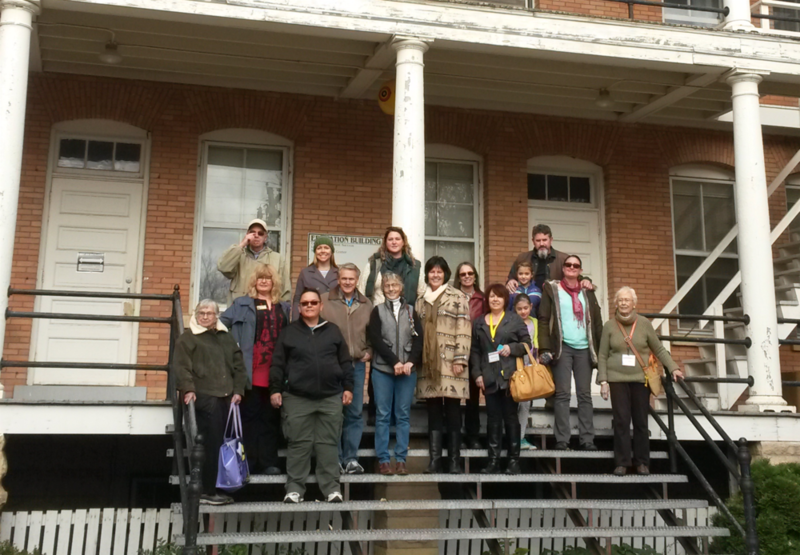 PND tour-goers pose with Dennis Neumann (Back row, left) outside the Education Building at United Tribes Technical College and historic Fort Abraham Lincoln, October 23, 2016. Preservation North Dakota joined members of the State Historical Society in celebrating the 50th anniversary of the National Historic Preservation Act at the annual Governor’s History Conference in Bismarck. To illustrate the value of historic preservation up-close, PND hosted historical walking tours in the Bismarck area, ending the weekend’s activities with a guided tour of Forth Abraham Lincoln, now the campus of United Tribes Technical College, two miles south of Bismarck.